It has been a very exciting month here at Edgefolio! 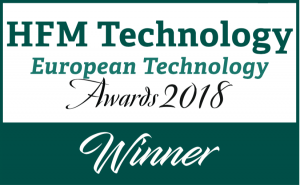 This month Edgefolio’s fund data management & analysis solution won the title as “Best CRM for the Hedge Fund Industry” by the European Hedge Fund Technology Awards 2018! The team at Edgefolio is delighted to have won this prestigious award and remains dedicated to developing industry-leading, compliant solutions for some of the world’s largest hedge funds. We always strive to improve and update our products to our clients’ needs, hence why we can introduce two new and highly anticipated updates to the FundPortal – this month alone! The first new feature allows for the sharing of user-specific documents. 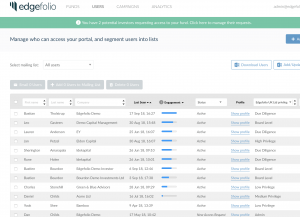 In FundPortal, you already had the rich Fund Documents Room, in which each file is assigned a privilege level. 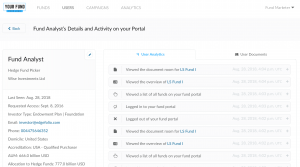 Each of your FundPortal users also has a privilege level which grants them access to the corresponding documents. However, we received a lot of feedback from our clients that asked for the ability to share a document with a single user. A perfect example of this is securely sharing an Investor Balance Statement with a specific investor. In addition to this feature, we also launched a User Analytics tab, which shows the list of all actions the user performed on your FundPortal, giving you a powerful insight into what your clients pay attention to. Our second new feature offers an Engagement Level overview of your clients. The aggregated system weighs users’ activity against each other to make it easy for managers to identify their top investor prospects. Managers are now equipped with a better level of understanding of who to focus their time on, rather than chasing loose ends – making their fundraising less stressful. This is what happens when technology and behavioral analytics get to work together! We hope you enjoy these new features, just as much as we enjoy putting it together for you! Please take part in Edgefolio’s newest Interview Survey! This month we have decided to use our network and communication tools to support some of you – helping you make connections while engaging in discussions and debates. The goal is to put you in the spotlight of our community, so opportunities to learn will arise to both you and your counterparties. Over the next couple weeks, we will send you over a list of questions, and will kindly ask you to answer as many as you would like. The questions will be touch topics such as your background, your company, your strategy, the way you operate, challenges that you are facing, what makes you unique etc. Please feel free to get in contact regarding the survey here. We are also extremely pleased to announce The Guardian Multi Family Office as our newest FundPortal clients. The Guardian Multi-Family Office will be utilizing FundPortal to enhance its delivery of in-depth financial information, reporting, and analysis of its SICAV Sub-Funds in New Zealand. “I am very excited to welcome our first Kiwi clients to Edgefolio. Having grown up in New Zealand I am proud to see that our technology has made its way across the globe. Looking forward to working with Maurizio and Scott in helping them scale their business” – Rowen Pillay, CEO Edgefolio. Where are the opportunities in fixed income oriented hedge funds? With rising interest rates and fairly tight credits spreads, are there still opportunities with fixed income oriented hedge fund strategies? The U.S. Department of Labor recently released a guidance regarding how retirement plan sponsors should consider environment, social and governance (ESG) factors when picking a plan’s investments. Meanwhile, in Europe, regulators are reviewing feedback on proposals to put the European Union’s financial sector front and center in achieving the EU’s climate change and Paris Agreement obligations. Financial advice on suitability tests. ESG in the investment process. Defining what is environmentally sustainable. “Investors returned to the hedge fund industry with net positive flows to start the second half of the year. So, all is well, right? Unfortunately, no. The hedge fund guru dissects the big debt meltdowns by converting a sprawling issue into a clear-cut process of cause and effect in his new book. The book will detail Dalio’s in-depth study of how debt crises have operated throughout history, which allowed him and Bridgewater Associates to anticipate and successfully navigate the financial crisis ten years ago. Thank you for reading our Newsletter. We hope you enjoyed it. If you did, why not subscribe? Follow us on LinkedIn, Twitter and Facebook to keep in touch with Edgefolio. Edgefolio is an award-winning technology provider in the asset management space. We offer powerful off-the-shelf products for different stakeholders, as well as custom enterprise solutions. Copyright © 2018 The Edgefolio Group. All rights reserved.